Keep your phone in one simple, easy to reach place while you drive. Supreme suction cup provides strong adhesion to keep your phone locked in place. 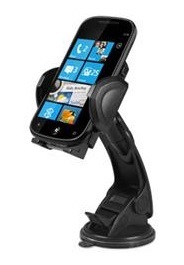 The rotatable grip expands to accommodate even the largest smart phones on the market. Adjust the neck to angle the viewing to your liking. Supports Android smartphones and tablets.